You are strictly prohibited from bringing professional camera equipment and “your problems,” to this exhibit. 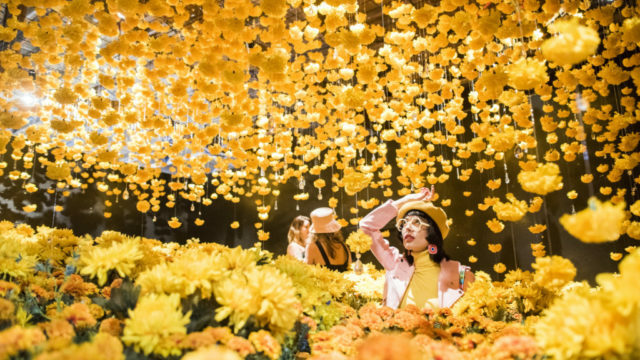 There is a 20,000-square-foot space in the downtown Los Angeles Arts District that claims to make you happy. 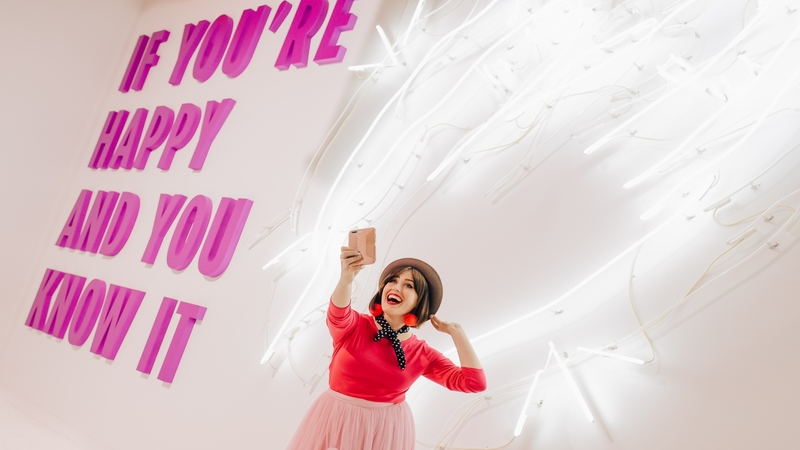 “If you’re old enough to smile, you belong inside,” boasts Happy Place, a pop-up exhibit that opened Monday, November 20th. The space was created by Jared Paul, manager of New Kids on the Block, Il Divo, and the brains behind the touring production of Dancing With the Stars. Random. But he didn’t invent this fad, he’s just playing into it. Refinery 29’s 29 Rooms, San Francisco’s Color Factory, and the touring Museum of Ice Cream, are all technicolor, selfie-encouraging, pay-to-play environments for curating your #aesthetic. Even if thousands of other people get nearly the exact same photo. I’m not worried about Paul making back his investment, whatever it may have been. The exhibit, which operates from 11 a.m. until 10 p.m., sold out opening day. General admission tickets are $28.50 each and VIP packages, which come with a personal photographer to follow your group through the approximately hour-long experience, are $199. “To make this dream come true, we set out on a journey to create a special place filled with smiles and laughter for all. With the amount of unfortunate events happening recently, I believe that our world as a whole can use more happiness,” said Paul. But is a giant high heel made out of M&Ms or a room full of light boxes that say “live, laugh, love”—dead serious—the solution? This infantilized Candy Land for adults seemed confused. Sometimes it wants to be a museum, a place filled with unique artist-created installations to temporarily live and engage within. Sometimes it admits to being nothing more than a high-budget photoshoot set playing into the existing millennial pink and colorful pool floatie universe we’re drawn to on our Instagram discover feeds. While I was skeptical from my initial read of the press release, I imagined a more immersive experience mixing sound, smell, touch, taste, in a more serene, scientifically proven way. While the exhibit was very hands-on, the elements felt random and lacked any sort of calculation. I expected, and almost wished for, L.A. yogi-style reflections or prompts around happiness and mood. Write something that makes you happy in lipstick on this mirror and take a selfie in it. Smell this perfume-doused pastel paper and imagine a time you felt at peace. There was nothing of the sort. But that Ariana Grande and Zedd banger “Break Free” played loudly, and I got a free cake pop. So I feel right to judge The Broad’s Infinity Room or Murakami’s selfie-worthy collections a little differently. I breezed through the “exhibit” in close to 30 minutes. Watching girlfriends perfectly pose in a ball pit, families soothe their moody children to get a group pic for the ‘gram, and fashion blogger-looking women jump up and down repeatedly to perfectly time a Boomerang made me feel like I was in a dystopian Disneyland. I wanted to like it. I’m an internet person. I have more than 2,000 Instagram followers. I was wearing a brand new outfit. I am the target audience. But it didn’t hit. Instead, it made me strangely recoil and reflect, feeling almost ashamed to the point where I took myself to a beautiful lunch and read a book after, trying to make up for the shallowness I felt I had just experienced. If you check out the Happy Place geofilter on Instagram, everyone’s photos look great. These people know what they’re doing. Clearly. No one pays thirty bucks and doesn’t get a picture worth faving. I wasn’t alone in my discomfort. Selomé Samuel, a 30-year-old New Yorker, went to the preview of the exhibit at the request of her friends. “The ‘art’—if you can even call it that—felt sugar-coated and contrived without having any level of substance,” Samuel said. Nowhere in the space are artists attributed. There are no plaques, audio tours, or signage explaining the titles of the pieces or names of the artists. Their names are not mentioned on the website or in the press materials. Despite her disgust, Happy Place would likely be pleased that she used the word whimsical. Bruna Nessif, a 29-year-old Los Angeles-based writer, appreciated the childlike effect. “For at least an hour, I was able to forget about adulting and just have fun with multiple themed rooms. It was a great way to feel like a kid again with my friends,” she said of her experience. Maybe she’s right. It’s not that deep. I didn’t go to Happy Place expecting for my high-functioning but always lingering depression to melt away in a colorful ball pit. But I thought for such a fuss, it’d have a little more intention and backstory. I just thought I’d take the feeling with me, even for just an hour following my experience. But any memories faded quickly as I navigated past the $12 rainbow grilled cheese truck back to the hectic traffic of downtown. Inauthentic is the perfect word. But hell, the one photo I posted got over 200 likes.